BEAUTIFUL HOME WITH NO REAR NEIGHBORS. This home has four bedrooms, three full bathrooms and has 2820 square feet. The interior of this home features a very open, bright and airy floor plan with a formal dining room, formal living room, family room and a large kitchen with a breakfast bar, island and nook. The foyer has beautiful upgraded glass doors that opens up to the formal living and dining room with a beautiful gas fireplace. There is tile in all wet areas, formal living room, family room and kitchen. Throughout the house there is crown molding, blinds and plant shelves. The Master suite features a tray ceiling, his and her closets and sliding glass doors that lead out onto the screened covered lanai. The garden bath has dual sinks, jetted garden tub and a large shower. Bedrooms two and three have ceiling fans, walk-in closets and share a bathroom which is a tub/shower combo. Bedroom four is currently being used as a den. Bathroom three has a large shower and a door leading out to the lanai. The exterior has a circular driveway that was done in 2010, two car garage, exterior paint 2018, a huge, screened, covered lanai, NO REAR NEIGHBORS, fresh landscaping, gutters, sprinkler system, gas appliances (ALL APPLIANCES STAY) and a Whirlpool filtration system for the whole house. 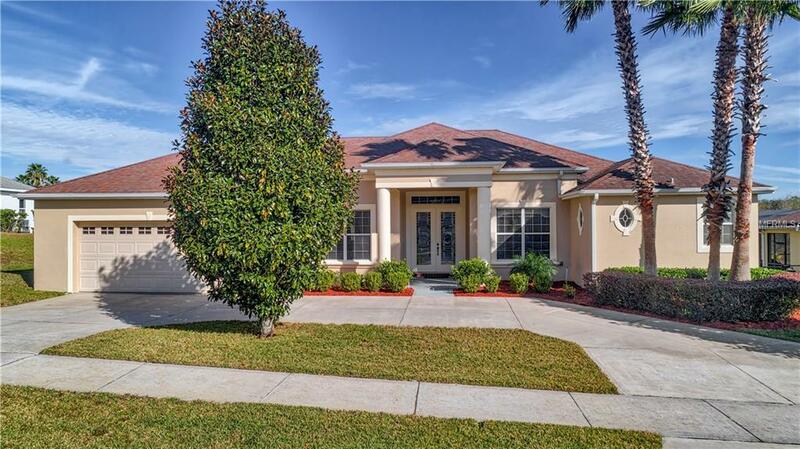 This home is close to shopping, schools, playgrounds, Clermont Chain of Lakes and major highways. MAKE YOUR APPOINTMENT TODAY!! Additional Lease Restrictions Check With Covenants Restrictions And Hoa. Pet Restrictions Check With Covenants Restrictions And Hoa.